At Fastlane, Ronda Rousey interfered in the Becky Lynch/Charlotte Flair match, disqualifying Charlotte. Thanks to the RAW Women's Champion, Lynch is now a part of the title bout at WrestleMania. Becky Lynch won the Women's Royal Rumble match this year, last eliminating Charlotte Flair. Lynch immediately challenged Ronda Rousey, the woman she was originally supposed to face off against at last year's Survivor Series event, but an accident involving Nia Jax would cause an injury, forcing her to miss the event. Since then, Lynch has been harassing the Baddest Woman on the Planet nonstop. Nearly every day, The Man has taken shots at Rousey, hoping to get a shot at the champion. And though she won the Royal Rumble, her title bout was taken away from her by Vince McMahon. At WWE Fastlane, Lynch had a chance to win back her opportunity. To do that, however, she had to beat Charlotte Flair with a bad leg. Charlotte had Becky Lynch beat in the middle of the ring at Fastlane. Locked in a Figure-8-Leglock, Lynch was nearly set to tap out, but Ronda Rousey rushed the ring and punched her in the face, disqualifying Charlotte and making the RAW Women's Championship match at WrestleMania a triple threat. 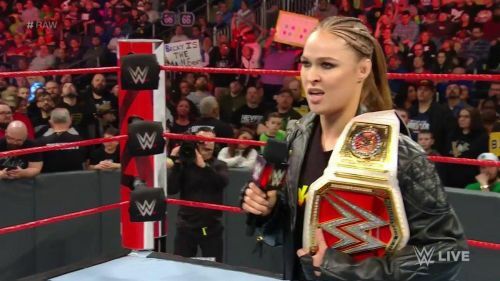 On Monday Night RAW tonight, Ronda Rousey took to the ring to explain her actions at Fastlane. Rousey said that she wants the biggest challenge she can get. In fact, the WWE can make it a 2-on-1 handicap match if that's what they preferred. It doesn't matter to the champion, because she's here to prove that she's the Baddest Woman on the Planet and that Lynch and Charlotte are jokes. Rousey has made headlines over the past week after calling the WWE "fake" and tonight she added fuel to the fire by claiming it's all a sham. At WrestleMania, Rousey wants to show the entire WWE Universe that their heroes are cowards and that no one in the company has the ability to step up to her.